, a celebrated and learned lawyer, was the son of a rich merchant of Milan, according to Pancirolus, and born in that city in 1492. After having studied the liberal sciences under Janus Parrhasius at Milan, he attended the law-lectures of Jason at Pavia, and those of Charles Ruinus at Bologna. Then taking a degree in law in his twenty-second year, he followed his profession at the bar, in the city of Milan, till he was called to the law-chair by the university of Avignon. He discharged his office with so much capacity, that Francis I. thought he would be a very proper person to promote the knowledge of the law in the university of Bourges, and accordingly prevailed on him to remove thither in 1529; and the next year he doubled his salary, which before was six hundred crowns. Alciati acquired here great fame and reputation; he interspei’sed much polite learning in his explication of the law, and abolished that barbarous language, which had hitherto prevailed in the lectures and writings of the lawyers. Francis Sforza, duke of Milan, thought | himself obliged to bring back to his native country a man who could do it so much honour; and this he compassed at last, by giving him a large salary and the dignity of a senator. 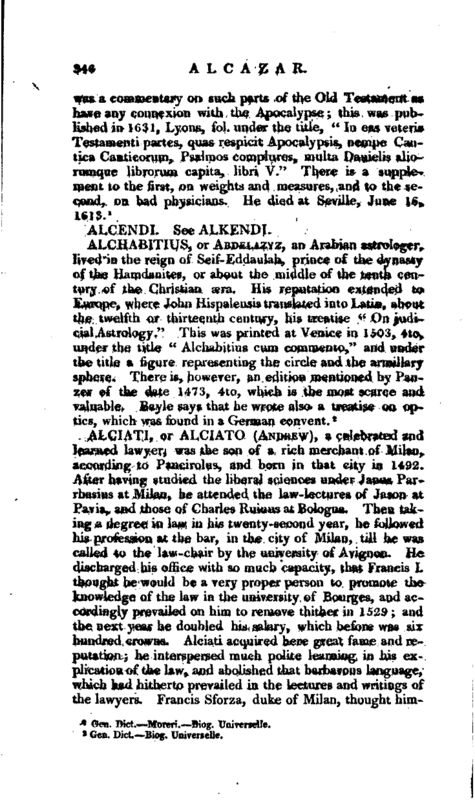 Alciati accordingly went to teach the law at Pavia, but soon after removed to the university of Bologna, where he continued four years, and then returned to Pavia; from whence he went to Ferrara, being solicited thither by duke Hercules d‘Este, who was desirous to render his university famous. 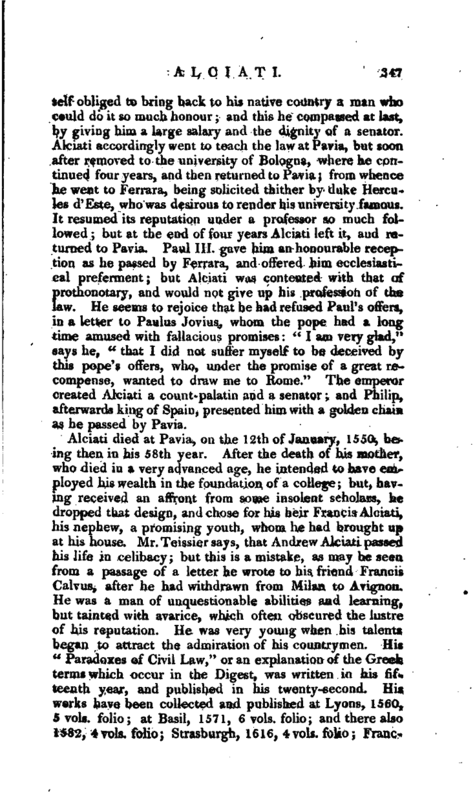 It resumed its reputation under a professor so much followed; but at the end of four years Alciati left it, and returned to Pavia. Paul III. gave him an honourable reception as he passed by Ferrara, and offered him ecclesiastical preferment; but Alciati was contented with that of prothonotary, and would not give up his profession of the law. He seems to rejoice that he had refused Paul’s offers, in a letter to Paulus Jovius, whom the pope had a long time amused with fallacious promises: “I am very glad,” says he, “that I did not suffer myself to be deceived by this pope’s offers, who, under the promise of a great recompense, wanted to draw me to Rome.” The emperor created Alciati a count-palatin and a senator; and Philip, afterwards king of Spain, presented him with a golden chain as he passed by Pavia. Gen. Dict.—Moreri.—Biog. 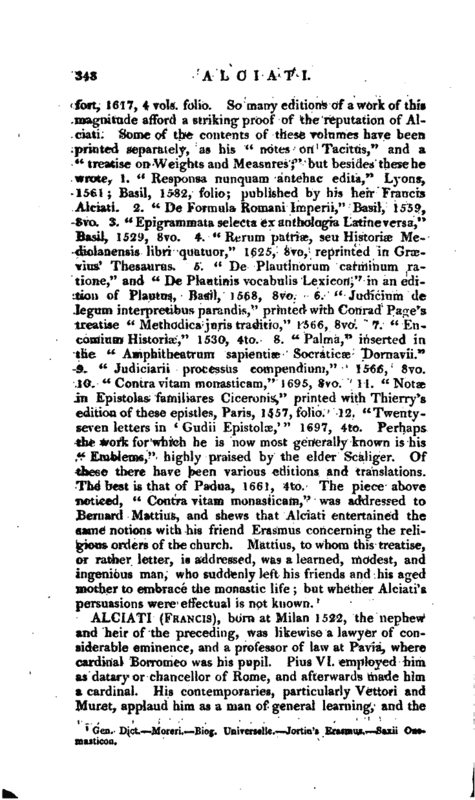 Universelle.—Jortin’s Erasmus.—Saxii Onomasticon.